Labyrinth Escape is FPS shooter where player target is to survive and find correct route out of the labyrinth. There is only one right route. Other route leads to player death or dead-end. Player has to shoot with weapon to the wall and find that way right wall piece which move or destruct and follow that route. There is also bomb and other damageable objects which reduce player health. When player dies he respawn to beginning of the level. In the end of every level there is portal which move player back to main menu. Final version will contain different themed labyrinths. 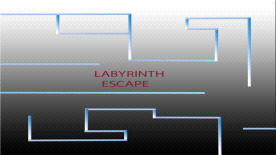 Labyrinth Escape uses the Unreal® Engine. Unreal® is a trademark or registered trademark of Epic Games, Inc. in the United States of America and elsewhere.” and “Unreal® Engine, Copyright 1998 – xxxx, Epic Games, Inc. All rights reserved."